We were established as "Memorial-610 Animal Clinic" in 1968 by Austin W. Weedn, D.V.M., a member of the first class to graduate from the Oklahoma A&M (now Oklahoma State University) College of Veterinary Medicine in 1951. Dr. Weedn first practiced nearby, in an old "Quonset hut" building on North Post Oak Road. The precise location is just where the Katy Freeway passes under North Post Oak. He practiced with several other well-respected veterinarians who made their careers in this area, including Drs. "King" Gibson, Paul Kramer, and George Sprankel. Austin Weedn was a quite capable entrepreneur in addition to being a "cutting edge" veterinarian. Twice he left this neighborhood to establish new animal hospitals, first to the Champions area to open the FM 1960 Animal Hospital and then to Clear Lake City to establish the NASA Veterinary Clinic. One of his proudest possessions was a picture of the Earth taken from space, signed by Mercury Astronauts who were his clients. Twice he left Post Oak, and twice he returned. The second time he leased an old brick barbecue/beer "joint" that was built in the thirties, and an old barn that had been a livery stable since the early 1900's. They stood on North Post Oak near Memorial, within 25 feet of the Loop 610 Freeway. Many of his clients remembered renting horses at the stable to ride in Memorial Park, in days long before the freeway was built. The old restaurant was enlarged and remodeled to become Memorial-610 Animal Clinic, and he at first used the stable to house the large animal portion of the practice. He later chose to close the large animal part of the practice, so the stable was painted bright yellow, and remodeled to house an art gallery. Audrey, Dr. Weedn's wife and workmate, ran the "Yellow Art Barn and Frame Shop" there for many years. It was an important and well known landmark for this part of Houston. After twenty-six years of exemplary service to pets, clients, and his profession, Dr. Weedn retired from Veterinary Practice in 1978. Dr. David N. Shell, who joined the practice in 1975, took his place. Nine years later, in 1987, the practice was relocated to new facilities about one mile West, at the present location on Antoine Drive. The "Memorial-610" designation was carried to the new location. Dr. Shell practiced medicine and surgery until 2008, when he retired and left the reigns to his partner, Dr. Stephen T. Pittenger, who he hired in 1995. 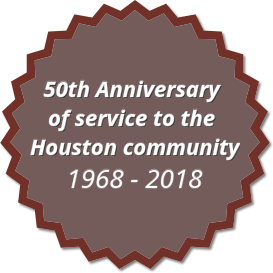 The "Memorial-610 Hospital for Animals" continues a string of service to the Memorial/Spring Branch/Tanglewood communities of Houston that started in 1951.